(Chinese) Download Dash for your car, the "car doctor"
(Chinese) Dash to help you move your car to the "cloud"
Dash featured in USA Today - "Lost in the lot? Apps locate your parked car!" Data is the new nitro - "Harnessing the Data Exhaust of Vehicles"
Can This App Actually Make You A Better Driver? TU Automotive Detroit Awards 2018 for "Best Data/A.I. Product/Service"
Dash is finalist at the TU Automotive Detroit Awards 2018 for "Best Data/A.I. Product/Service"
The power of automotive data for marketers. Novel use cases for Dash's platform, featured on AdExchanger. Get the latest on Dash's insurance product in Europe, with @REMA1000 Kjor Smart ('Drive Smart') launch. Silicon Valley vs Detroit: Who is the next "auto city"? "Petrol consumption fell an impressive three liters of petrol per 100 kilometers" using Dash's Drive Smart (Kjor Smart with REMA 1000) insurance product: . 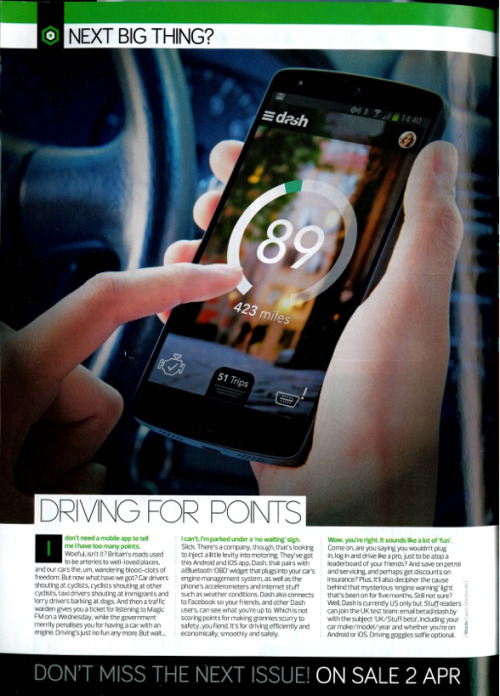 Can the Dash app train you to be a better driver? One year road test! Dash and our friends at Vinli feature in this TU Automotive article on how car makers are nurturing innovation. El sistema de Dash es elegido como mejor servicio en la 'nube' del mundo. Combina 'hardware' y 'software' para convertir cualquier vehículo en 'inteligente'. Feb 27, 2014 — Dash Labs, Inc.
Jul 21, 2014 — Bartel King, Jr.
Apr 30, 2014 — Bertel King, Jr.
Big Data – big opportunity or big challenge for the auto industry?